After seven years of deliberation over the preferred location, Beijing's second airport is set to come up at Daxing district in the city's south, Hong Kong-based Ta Kung Pao reported on Tuesday. The newspaper quoted an unnamed source as saying that the National Development and Reform Commission, the civil aviation authority, and the governments of Beijing, Tianjin and Hebei have finally reached a consensus to build the second capital airport in Daxing district. Now the plan awaits the nod of the State Council, or the cabinet, the newspaper said. Previously, Daxing district of Beijing, Wuqing of Tianjin, and Langfang of Hebei province competed with each other for the major project. Economic experts differed on how to find the best location that can make the new airport a growth engine for the Beijing-Tianjin-Hebei area. Daxing district government Tuesday declined to comment on the news. But Shen Baochang, the Daxing district Party secretary, told the media earlier that Lixian town, in the southeastern part of Daxing, had been earmarked in its land-using plan as the best location for Beijing's second airport. Lixian town is considered "ideal" for an airport in terms of its terrain, infrastructure, climate and air traffic control conditions, he said. As Daxing is the southern gateway of Beijing, adjoining Hebei and Tianjin, Shen said if built in Daxing, the new airport could boost the economic development of Tianjin as well as Langfang, Zhuozhou, Shijiazhuang and Baoding in Hebei province. Construction will start in 2010 and be completed in 2015, China News Agency quoted Zhang Gong, chief of the Beijing Development and Reform Commission, as saying in March. With three terminals, the existing capital airport has a designed capacity of handling 76 million passengers and 1.8 million tons of cargo a year by 2015. The third terminal, built at cost of 27 billion yuan ($3.97 billion) and opened last year, is the largest and most advanced in the country. 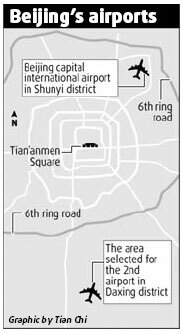 Ta Kung Pao reported that the new airport would be developed into an airport hub that can handle 60 million passengers. It also said that since residents in Lixian town heard the news in January, they began building more houses in order to get more compensation when they relocate. The idea for the facility emerged in 2002, after Beijing won the rights to host the 2008 Olympics, but in 2003 it was decided that the Capital International Airport would be expanded to relieve the pressure at the time of the Games. The location of the second airport had turned into a contentious issue, as authorities in Tianjin municipality and Hebei province wanted the new airport to be built in their regions.